The Remote Fire Gas Gun utilizes a high performance microphone with an excellent signal-to-noise ratio along with a 12 cubic inch volume chamber. A solenoid valve releases gas from the gas gun volume chamber into the well. The solenoid is operated automatically from the Well Analyzer system or the Model M. The Remote Fire Gas Gun cannot be operated in the implosion mode. 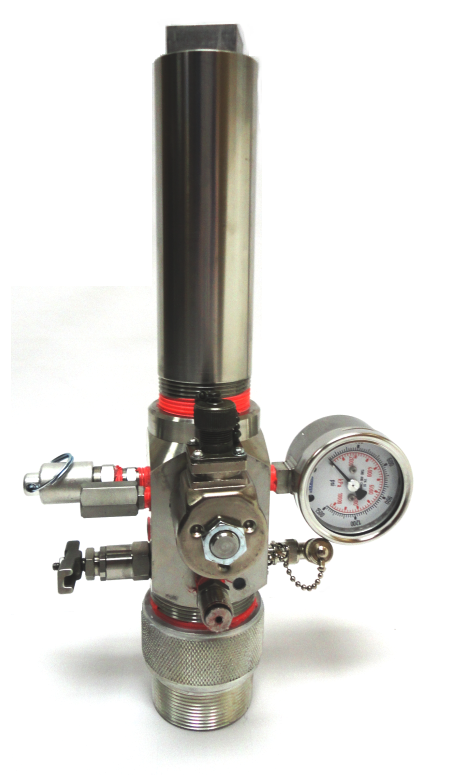 The Remote Fire Gas Gun is required for automatic acquisition of pressure transient data. It is normally supplied with a 1500 PSI pressure gauge and a 1500 PSI pressure transducer. The Remote Fire Gas Gun is limited to 1500 PSI working pressure. Note: For single shot analysis, the 5000 PSI implosion gun is preferred when the well pressure exceeds 1500 PSI. The Remote Fire Gas Gun utilizes a solenoid with a small dart valve and a small orifice. The dart valve releases gas from behind a ½ inch moveable piston that allows gas from the gas gun volume chamber to flow into the well. These small moving parts will become clogged and inoperable if sand and debris are blown from the well into the gas gun volume chamber. Debris and sand will prevent the dart valve from properly sealing, and gas will bleed continuously from the gas gun volume chamber into the atmosphere. This requires that the gas gun be disassembled, cleaned and reassembled. To view the pdf "Preventative Maintenance for the Remote Fire Gas Gun" click here. To view the Remote Fire Gas Gun Drawing click here.